One of the Earth’s great renewable energy sources is actually the energy that can be found in all the waves of the ocean. Let’s look at this further. If you have ever been to the ocean, you were probably fascinated by the phenomena of the waves crashing against the shorelines as the tides came in. The ocean’s tides are the product of gravitational pull of the sun and the moon, as well as, the Earth’s rotation. It causes the ocean waters to be raised and lowered from time to time. The tides have cycles of twelve and one half hours, twice per day, and are easily predictable. The use of tidal power is seen as early as the twelfth century where tidal mills used the force of the tides to grind grain and corn. The eighteenth century brought competition from windmills and waterwheels. Tidal mills pretty much became extinct with the invention of cheap steam engines. In 1967, France became the first to be able to put tidal wave power to work on a large scale to produce electricity. The generation of electricity from tidal waves is similar to that of hydroelectric power generation. Bigger dams, known as barrages, are built on the bottom of a tidal basin. Gates on the barrage allow the tidal basin to fill during incoming high tides. Likewise, the basin will empty through a turbine during the outgoing tide. This would turn an electric generator for the production of electricity. There are also systems that generate electricity from incoming and outgoing tides. This system can have a negative effect on plants and animals in the area. Tidal turbines are a new technology used for tidal energy. 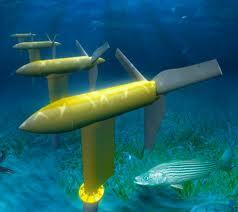 They are similar to wind turbines and are arranged underwater in rows. They work best in areas with strong tides. Although they are heavier and costlier to build, they also are capable of capturing more energy. They are also the least environmentally damaging of all the tidal power technologies, since they do not interfere with migration paths. In order for tidal power to work successfully it requires a tide difference of at least sixteen feet. Unfortunately there are only a few places where this occurs. This means tidal power plants cannot just be constructed anywhere. There are only a handful of sites on Earth with this type of tidal range. At present, France is the only country that has been successful in using tidal power. It is hoped developments in technology, through research, will be made to allow better use of this, what is now, wasted energy. The future of tidal energy seems hopeful. Tidal power has great potential and hopefully we can make better use of it in the future in our quest to find a replacement for fossil fuels.